Ahmedabad is a city that continues to rise as the days go by. In fact, it is one of the most love cities in the country today. The real estate market in Ahmedabad is thriving with residential and commercial projects throughout the city, serving as good investment opportunities that are pretty hard to miss. However, investing at the right location is ideal for higher property value in the years to come. A number of locations in Ahmedabad have gained popularity over the years, but SG Highway is one location that is on the mind of many. Sarkhej – Gandhinagar Highway, most commonly referred to as SG Highway, is a vibrant location in Ahmedabad that is home to a wonderland of luxuries and comforts. As this location continues to attract a number of investors and home buyers and there is a question in your mind, read a little more to know why SG Highway is a smart investment proposition. To start off, SG Highway is a location that offers fabulous infrastructure, both physical and social. While the highway is a part of NH8C, it also offers fast commuting to a number of locations inside the city and its outskirts as well. With clean and wide roads, travelling is nothing, but a piece of cake. When it comes down to social infrastructure, this location offers everything that is premium. From reputed schools and colleges, to hospitals, medical centres, malls, shopping centres, supermarkets, cafes, restaurants, cinemas, entertainment zones, retail outlets and more, no place is hard to find when residing at SG Highway. Where there is superb infrastructure, there is a good rise in property demand and it is an undeniable fact. This location lets you live a modern-day lifestyle that is packed to perfection. Although property prices at other locations in Ahmedabad are fluctuating from time to time, property prices at SG Highway have been growing at a steady rate and the same is to continue in the coming days. While many real estate companies have rooted themselves at this location with a number of residential projects, choosing the ideal project is important for every investor at the end of it all. 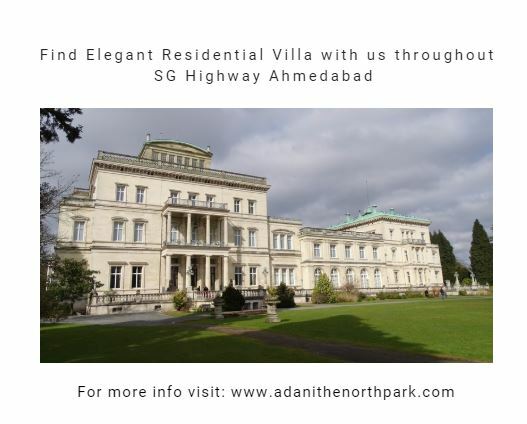 Adani The North Park by Adani Group is a good residential project to consider when looking out for new investments or luxury homes at SG Highway, Ahmedabad. This development offers beautiful 4BHK, 5BHK and 6BHK villas with areas sizes starting at 533 sq. yd. and going up to 1167 sq. yd. Dedicated to offer luxury and comfort of the highest order, selected residential spaces offer a private swimming pool, jacuzzi and elevator. This development is filled with world-class internal and external amenities that are simply fabulous. Starting at a price of Rs.3.90 Cr. and moving upwards, the villas at this development are high on luxury, but low on cost.